In each of Maggie LaNoue’s Albion-centered art pieces, details like buildings and people give way to the larger picture: Albion’s small-town atmosphere condensed onto paper. 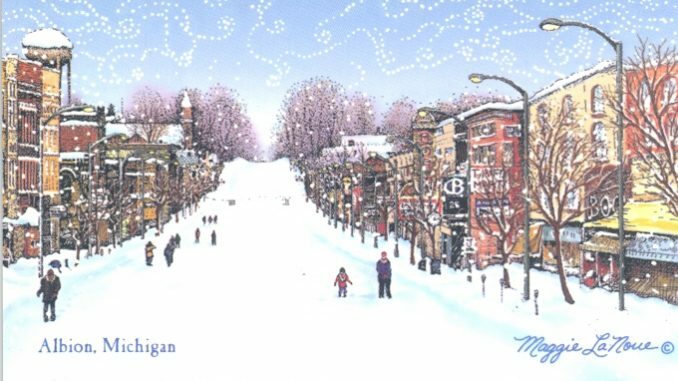 Without the use of a ruler in most cases, Maggie LaNoue creates postcards, murals and websites that are each meant to portray Albion as a close-knit community, one she calls home. “I have been doing the same simple thing for a long time,” said LaNoue, who has been documenting the community for many years and plans to keep doing so. LaNoue is the founding president of Albion Design & Marketing, a company that crafts art or website designs for business communication. While LaNoue’s artwork is inspired by the community and created for the members of the community, there are other factors that she incorporates into her work. Growing up attached to Albion through family ties rather than hometown roots, she began to explore and build relationships with the community and college from a young age. Growing up in a suburb of Washington, D.C., LaNoue often visited the nearby Corcoran Gallery of Art as a child. Here she found a passion for art and still holds vivid memories of the place. “It was really nice, with marble staircases. I can still remember the smell of oil paints,” said LaNoue. Visiting Albion each summer on family trips, LaNoue decided to follow her family legacy of attending Albion College. In pursuit of a visual arts degree, LaNoue dove into her passion. As a summer job during her time at Albion College, LaNoue followed her father, Robert Benjamin (‘42), into government work, specifically into the U.S. Army Materiel Command as a part of the National Defense Department. She was in charge of drawing bombs and material weapons. As a part of the program, LaNoue traded in her pencils and paint for technical pens and computers. It was not, however, the first time LaNoue dealt with computers. Thanks to her father, she grew up discussing computers and math problems around the dinner table. LaNoue’s experience put her ahead of the new technology wave. Taking advantage of her technical knowledge, LaNoue bought and sold websites while learning how to code for them. One of the earliest websites she created and still runs is for the local Cascarelli’s family restaurant in downtown Albion. LaNoue started waitressing there during her junior year at Albion College and kept working there until she decided to become a full-time artist around 1983. “I just quit and I have never punched a clock since then,” said LaNoue. LaNoue sometimes pairs her scenic pictures of the community with the writings of Frank Passic, a local historian featured on her Albion website. 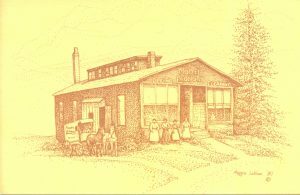 To help promote the history and culture of the small town, LaNoue has created several postcards. 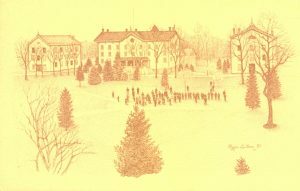 Recently, she received some of her original artwork from Wayne MacKenzie (‘82), who purchased several of her postcards while he was attending Albion College. “These are a gift to you. Hoping you may use your creativity to join the past to the present,” wrote MacKenzie in his letter. LaNoue’s artwork has since caught hold of a few organizations’ attentions. 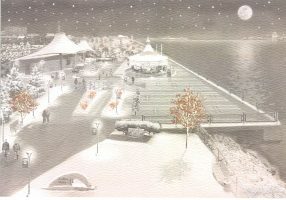 She creates a new holiday card for the Detroit Riverfront Conservancy every year. Her most visible project may be the 56-foot-long mural in the heart of Albion across from the Huntington Bank drive-thru she helped organize and carry out. LaNoue created the mural idea, the original layout and helped with the painting, which was open to the public. This mural, “Crossing the River”, includes seven panels to represent a full year in Albion. The seasons change going across the mural, portraying all the different recreational activities the community members of Albion partake in throughout the year. The river theme continues throughout the rest of LaNoue’s work. With the water comes the theme of bridges. Original artwork pieces of the town are still hanging in Cascarelli’s and Charlie’s Tavern, both located in downtown Albion. Several of LaNoue’s pieces have also been featured in the Festival of Forks events. LaNoue had the chance to ride in a helicopter during the festival to help create a birds-eye view of Albion celebrating. The Albion and Marshall General Guide is LaNoue’s latest work. It’s an annual glossy flyer created and designed by LaNoue with the help of her daughter, Linda LaNoue. There are around 16,000 guides made and placed at locations in Albion and Marshall each year. The 2019 edition includes drawings of a Camperdown elm tree through the four seasons. “It’s a special kind of tree. The roots have a certain kind of elm and the top has another kind of elm created through grafting,” said LaNoue. The elm was located in Albion and died the year after the drawings had been completed. LaNoue has artwork for sale at Jolly Green Junction, Eastend Studio & Gallery and Pure Albion. 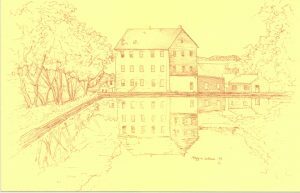 She also has several pieces up on her Michigan Prints site. Her main focus now is to add color to her old drawings instead of creating newer art. 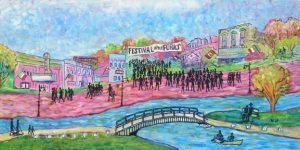 While LaNoue is still promoting Albion’s community through her art and websites, she also encourages the importance of community with Linda’s work as a fellow for the Albion Rising Tide Project. 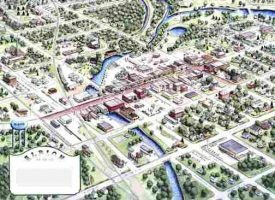 This project is set to provide Michigan communities with an organized communication platform to help create a successful economic framework. She actively supports her daughter’s efforts by helping bring traffic to the businesses that support Albion and Marshall. “I am an artist so I like to do things low-budget and my own way,” said LaNoue. Awesome article, Jessica! Your dedication to sharing the full story is appreciated. Great article, Jess! I love learning more about Maggie and seeing what new things she is working on. I didn’t even know she did the mural in the alley. How cool is that!